As good as it may seem, Sunday morning attendance is not the litmus test for success. Rather, I think success in God’s eyes may be more measured in the impact that the message of the Kingdom is having on how people think and live in our congregation, regions, cities and spheres of influence. “Repentance” means to change ones mind… True repentance will change ones mind resulting in changed actions by default (transformation). 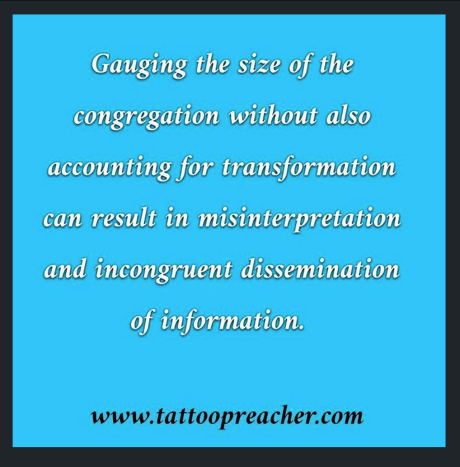 If this is the case, I wonder if it’s possible that the recycling and repackaging of stagnant religious information may be producing a mental or even idolatrous “form” of Godliness (as we become lackadaisical, feeling affirmed by the numbers and the “amens” and continue to pursue the affirmation before pursuing God) and in the process are denying the transformative power only found in intentional pursuit of Him. Just a thought racking my brain berries today as I ponder religious paradigms for success vs what God may actually consider true success… Maybe I’m wrong… Just sharing my thoughts. And this is not a judgment on any particular or specific ministry or style of ministry… Only considering the possibility of misinterpretation regarding how we view and weigh success…However, if this is the case, then the guy who trains up 12 people who in turn go out and revolutionize the world is more successful than the pastor with 100, or 1,000, or 10,000 who warm the pew and do nothing when they leave.